KJIPUKTUK (Halifax) – Many Nova Scotians with intellectual and physical disabilities continue to live in large institutions against their will, while others are being taken care of by ageing and senior parents. What many of them want is to live in their communities, typically in a small option home, with the necessary supports to allow then to live a full life, the kind of life most people take for granted. At a press conference at Province House this morning several speakers once again spoke of broken government promises, and the ensuing pain and suffering for the people directly affected and their loved ones. The press conference was called by the Disability Rights Coalition (DRC), and No More Warehousing: The Nova Scotia Association for Inclusive Homes and Support. 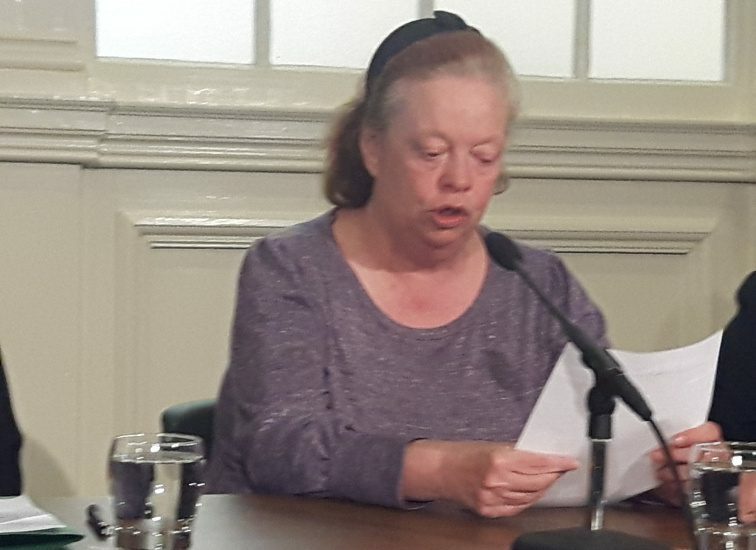 “We were so pleased that the three complainants won their human rights case,” said Barbara Horner, spokesperson for the DRC, referring to the human rights tribunal that recently vindicated claims of discrimination by three such residents of large institutions. “But even though government representatives testified that the system is broken, the tribunal did not find systemic problems. Does this not cry out for leadership? We have over 1500 people on a wait list, we have ageing and senior parents who continue to support their children at home, a lifelong commitment with little recognition and validation for the role we play,” Horner said. In 2013 the NDP government released a five year plan, commonly referred to as the roadmap, that would see large institutions closed, and small option homes built. Once elected, the Liberal government committed to that roadmap, but has done little to make it reality. The coalition believes that in order to keep its promise government needs to commit to building 25 new small option homes each year until 2023. Instead only eight such homes have been in various stages of completion over the last two years. This year’s budget has no new money allocated to roadmap initiatives. The Disability Rights Coalition has written an open letter to the Premier, once again raising the issues people with disabilities have been pursuing for so long. The letter is signed by a broad array of organizations and individuals. Other people who spoke at the press conference included Jen Powley, co-president of No More Warehousing, Jeannie Whidden, of People First Nova Scotia (PFNS), Donna Lee, a Provincial Advisor of PFNS, and Susan Leblanc, NDP MLA, and Barb Adams, PC MLA. What follows are the powerful statements given by Jeannie Whidden and Jen Powley at the press conference. Jeannie Whidden: Set our people free! My name is Jeannie Whidden. I am a member of People First, and of People First Nova Scotia (PFNS). PFNS has been working to free people with intellectual disabilities from a life in an institution since our organization started in 1989. We believe that people should not be forced to live in an institution just because they have a disability, but that everyone has the right to live in the community. The roadmap for transforming the Services to People with Disabilities Program says that people with disabilities have a right to live and be included in the community, and they should have maximum control over their lives. The roadmap promises that no one would have to live in an institution if they didn’t need to by 2023. The fact that there are well over 1000 people still in institutions shows that Nova Scotia is not doing enough to keep these promises and support our rights. Nova Scotia has made some steps toward providing more community housing for people with disabilities. But so far there are eight new small option homes planned, with only three in the works right now. At this rate there is no way the government will be able to fulfill the promise by 2023. It is wrong to make promises, and then to back away from it, or not to do what you say you will do. Canada adopted the UN Convention on the Rights of People with Disabilities in 2010. Article 19 states that people with disabilities have the right to live in community. Living in an institution is horrible. Many of our members have lived in institutions where they did not have freedom to make their own choices, have control over their lives, or even leave when they wanted to. People with disabilities deserve better. If the government thinks that an institution is an okay place for people to live then they should go try living in an institution themselves, and see what it is like. Let’s see how they like it. They wouldn’t last. To those people who are still forced to live in institutions in Nova Scotia PFNS encourages you to file a human rights complaint against the government and to demand the right to live in community and be respected. We of People First stand with you. We are calling on the government to keep its promise and set our people free! Hi, I am Jen. I am a 41-year old woman. I was diagnosed with Multiple Sclerosis at 15. I decided that I did not want MS to define my life. I moved to Halifax from Alberta when I was 23. For the last decade I have required 24/7 supports. I had to leave my job at the EAC in 2013, when my voice was no longer loud enough to carry a meeting. My parents do their utmost to support me. They have sold off family farm land in Alberta in order to provide me with the care I need. Now there is no more farmland left to sell. My parents can no longer afford the $100,000 annual bill for my care. Now I am faced with going into a nursing home. I am not the only person facing this situation, There over 240 people with severe physical disabilities between the ages of 16 and 60 currently being held in nursing homes. Because people with severe physical disabilities are warehoused in nursing homes, we started No More Warehousing, the Nova Scotia Association for Inclusive Homes and Supports. We held a panel discussion at the Halifax Central library in February to create public awareness. 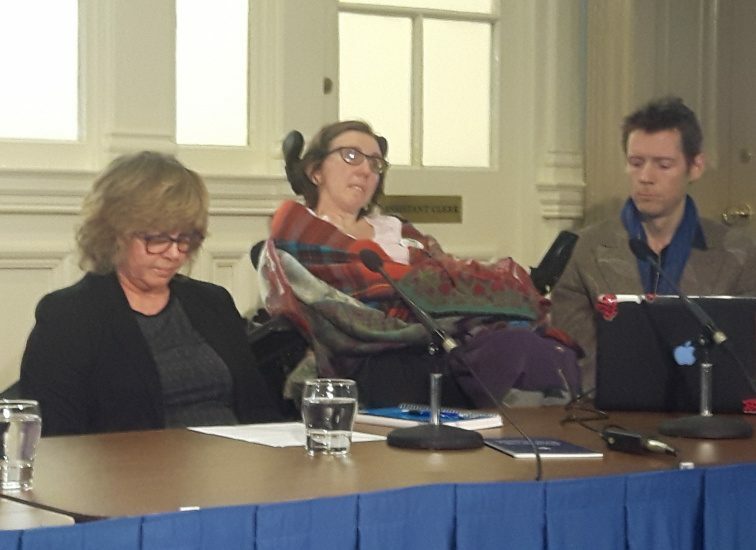 In a tv interview following the panel premier McNeil said that the government will eventually make it possible for all people with disabilities to live in the community. Just not yet. The government has a plan, we have to be patient, and understand that change takes time. Over six years government closed 25 institutional beds. At that rate it will take over 140 years to close all the institutions. Government ministers have been saying the same thing for more than 20 years. We need action, not words. Government reports in Nova Scotia, dating from 1984, have regularly recommended that people with disabilities are supported in communities, not segregated in institutions and nursing homes. We need government to dedicate the budget to implement the promises they made in 2013. In 2013 both the NDP and the current Liberal government fully endorsed the roadmap for transforming the Nova Scotia Services to Persons with Disabilities Program. They committed to implement the recommendations of the roadmap by 2023. SInce the government made the commitment the people with disabilities waiting for basic supports and services to live in the community has grown by almost 50%. The number of people unnecessarily institutionalized for no medical or legal reason, simply because they have a disability, has also grown. The government inaction contradicts the premiers words. SIx years after the roadmap was adopted the 10 years plan for implementation is still only in the initial stages, That’s not good enough. DIscrimination you say, you better believe it. The UN Convention on the Rights of People with Disabilities was adopted by Canada in 2010. This convention said that people with disabilities deserve the same choices as people without disabilities. Nova Scotia’s Disability Act of 2017 also states the importance of the inclusion of people with disabilities in everyday society. Yet the government still unnecessarily warehouses people with disabilities in nursing homes and institutions far removed from society. On March 3rd a Nova Scotia Human Rights Commission Board of Inquiry ruled in the Emerald Hall case that it was discriminatory to institutionalize three specific people who could have been living in the community. The ruling was careful to say that each case must be looked at individually, therefore we encourage everyone who is institutionalized and doesn’t want to be there, to file a human rights complaint. People with severe physical disabilities need to live where we can be part of the community, We need to be able to live where we can have 24/7 care as we require it. Warehousing is a violation of our fundamental right, and we are demanding justice.